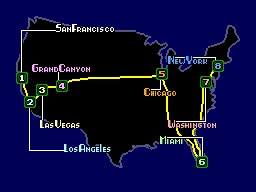 I first bought this game in 1992 as I wanted a Out Run game. The game is like a 2D version of Spy Hunter with Out Run overtones and Chase HQ gameplay. The game starts with an idea of which car/villain you need to be capturing. To get the villain it's a simple matter of racing down the very flat but winding road. While driving along the road you need to avoid other cars, signs, hay bales and oil slicks on the road. To help you catch the villain, about halfway through each section you get to drive into the back of a lorry to upgrade your car with such goodies like turbos, stronger chassis, faster engines and better tyres. So to stop the villains car you need to ram into the rear of his car until it grinds to a halt. The game has a great difficulty curve in it as it starts easy but slowly gets harder but completeable. Bright and colourful is the word here with good scrolling effect and good speed as well. 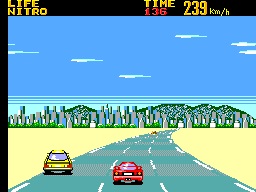 Like Out Run, you get to choose a music track to listen to while your driving, which are played fine from the beloved SMS. Other sound effects are drones from passing cars and skidding which are OK too. Smart fluid controls here and therefore easy to play with out reading the manual to find what does what. As I said, the game is easy to start playing with, has simple addictive gameplay and keeps you playing it time and time again. 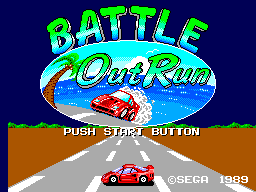 The game is very similar to Chase HQ and Special Crime Investigation and all three games are fine but I think Battle Out Run has a slight edge in the gameplay and graphics. It isn't rare and therefore should easily be found and not cost a lot either. Think of it as a hidden unknown gem.